Hua Hin is one of eight districts of Prachuap Khiri Khan Province, in Thailand. It is closely associated with the Thai royal family; they spend their holidays in Hua Hin. It offers a tropical climate, where the humidity is high, and the average temperature does not usually fall below 28°C so you can leave your wetsuit at home. Over the past few years, kitesurfing has become an extremely popular sport in Hua Hin. 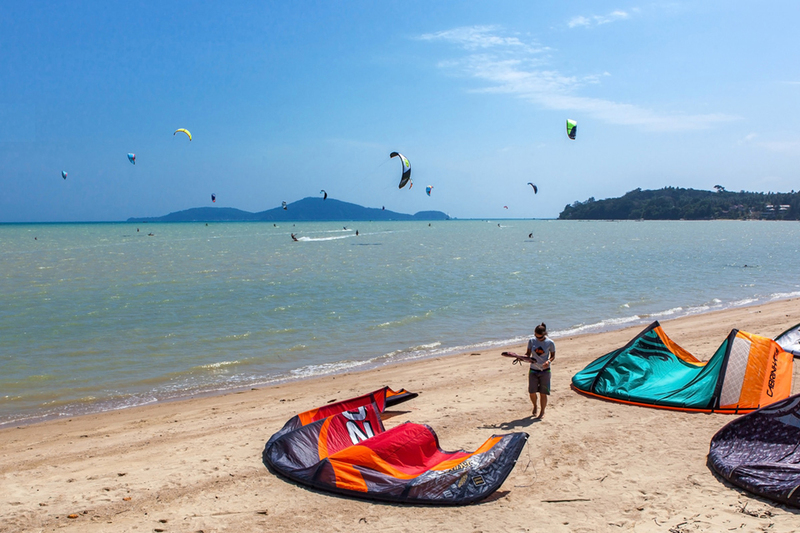 There are now at least ten kitesurfing schools in Hua Hin offering lessons and equipment. In 2009, Hua Hin hosted the Intercontinental Kiteboarding World Cup which brings kitesurfers and spectators from all over the globe. In Thailand, one can live on a meagre budget, and you will fall in love with the Thai food, the polite and friendly people and their culture. You can do plenty of activities and discover great places. Hua Hin has a tropical climate with high humidity and occasional rain. The best time of the year to visit Hua Hin is in the colder season from November to February. For those who like it hot, you can go from March to May, when the temperatures reach up to 35°C. The rainy season is from June to October. September is the wettest month. It’s called the rainy season, although it doesn’t rain every day. From mid-December to mid-January the wind blows from the northeast and varies from 10 up to 20 knots. From March to mid-April the wind speeds vary from kitespot to kitespot but can range from 15 to 20 knots. The spots in Hua Hin receive the best thermal breezes in Thailand during this time. Tides also play an essential role in Hua Hin. High tide from November to March, the sand disappears entirely at high tide, leaving little or no beach during the morning and sometimes all day. Low tide from May to October spring tides, which occur every 14 days, following the full and black moon phases, exaggerate the effect. They produce even higher or lower tides than usual. On high tide the beach gets more flooded, on low tide you will find a long beach with some exposed sandbanks in the water. There are many ways to get around in Hua Hin, but because the centre of town is very concentrated, the best way to explore is on foot. You can walk all the downtown area. Shopping or eating can be done in the huge malls, the many local markets or at the night markets. They offer all sorts of things! The public transport are pickups called Songtaews; they have four different routes. You also can rent a motorcycle; they are readily available almost everywhere around the city and quite cheap. Hua Hin is very flat, and motorbike can be a good way to get around locally if you don’t want to walk too much. Hua Hin is situated about 200km from the metropolis of Bangkok. Suvarnabhumi, the international airport is located in the east of Bangkok. Hua Hin can be reached using a variety of transport methods that are affordable. The fastest and most comfortable way from the airport to Hua Hin is by a modern 24 seat, non-stop coach. The price is 180 Baht. The journey takes around 3 to 4 hours. It’s also possible to travel from Bangkok (Hua Lum Pong Railway Station) to Hua Hin by train. The price of the train is around 100 Baht. However, the trains are quite slow so that the journey can take 5 to 6 hours. Every 20 minutes a minivan or bus is leaving for Hua Hin in the southern bus terminal (Sai Tai Mai) in the city centre of Bangkok. The fee for a van is around 200 Baht. Unless you book an extra seat, luggage space can be minimal. The journey takes approximately 3.5 hours. Taxis are quite affordable in Thailand and are the easiest but still the most expensive option. Be aware that depending on traffic and delays, these journeys can take longer. Thailand has one of the world’s greatest cuisines, and it’s still very affordable. All over the streets, outdoor stalls serve you delicious meals. No matter what time of the day it is, there’s always food available somewhere - and it’s freshly cooked. Many of the meals are made with curry, coconut milk and fresh fish or meat. You can choose either chicken, pork, beef, shrimps or fish. Most of the dishes are served with stir-fried rice, noodles and veggies. But it is a very international place, thanks to the tourists and expats around the country. You can also find a lot of savoury global food. Thais don’t drink water straight from the tap and neither should you. Bottles of drinking water are sold countrywide. Freshly squeezed fruit juices or shakes are a healthy thirst quencher and very popular. Depending on your preference, they can be made with coconut, lime, orange, banana, papaya and many other fruits. The three most famous local beers are Singha, Chang and Leo. Taste them, cheers! If you have a low tolerance for spicy food, remember to order your meal “mai pet”, which means “not spicy”. Don’t forget to go to Soi 88 for a nice dinner with friends, locals and live music. Nightlife in Hua Hin is different for those who are looking for a fresh beer with friends and those who are looking for some live entertainment. The main action starts in the evening at around 9 pm when everyone has had their dinner. The bars with bar girls are the most popular spots for foreigners to party in Hua Hin. At the Soi Bintabat, you will find lots of these bars and several British-style pubs. Many of them offer live music, some of them are sports bars. You can also find numerous karaoke bars, some of which are open late and can be good fun. Even if you're not quite the best singer, you'll always get a round of applause for your efforts. Try not to miss out on a cabaret show. Don't be put off by the fact that most of the performers are cross-dressers; they really can be great fun and quite a spectacle. White Lotus Sky bar at Hilton Hua Hin Resort: Where you will have the best view of the city at night. Later on, you can go to the Hilton disco “Brewing Company”. Close to the Hilton at the Bazaar is China White (Jean Olivier) disco and bar, which only gets lively once all the bars have closed. In the north of town, near Soi 7, is the large Hi4 pub and disco at the Hin Nam Sai Suay complex. This venue with live bands is very popular among young Thais. It’s easily accessible with transport within ten minutes and has plenty of parking. At weekends, expect it to be loud and rather busy inside. In the same vein but slightly more rough around the edges is the Luknam Pub on the main road to Pala-U. Along with Thai rock and country music, they serve drinks and a wide range of Thai food. In these places, you won’t meet many foreigners. There is tonnes to explore! The town has a lot to offer on the non-windy days to keep you entertained. You can visit many of the spiritual sights. There are Buddha temples all around the city with traditional rituals. Dive into the history of Thailand and Hua Hin by visiting its old train station or one of the many museums. For those interested in art, there are some art galleries too. There are golf and tennis courts and if you prefer an action-packed afternoon, check out the water parks or rent a jet ski. The underwater life is also beautiful, grab your snorkel to discover it. Also consider going to an island like Ko Tao which is close by, to do scuba diving or get a cheap PADI. All around Hua Hin you will be able to book day tours to discover the beautiful hidden places in and around the city. You can also do a food tour or learn how to cook like a real Thai. You will find many exciting night markets where you can walk along and do some shopping. Consider making at least a day trip to Bangkok, the capital of Thailand. It has a lot to offer. You can go hiking through spectacular nature, discover hidden waterfalls, explore mysterious caves hidden in the mountains and observe the exotic animal species living in Thailand like the gibbons, Asiatic wild dogs, the tiniest bat and many more. Thailand has different Natural Park and one of the most beautiful botanical gardens in south-east Asia with ornamental blooms and tropical plants, fruit plantations, world's largest palm and orchids collection. Hua Hin has a quite decent internet connection. Almost all restaurants and bars offer free Wi-Fi. You can get up to 10mb download and 7mb upload speeds here. Be aware of electricity shortage on heavy rainy days. Hua Hin is a popular destination. You can find luxurious resorts or villas in the hills to the West of Hua Hin, five stars hotels scattered along the beach and several guesthouses all around. And oh the food is so good! There's no shortage of things to do and see! Originally from France, Pauline and Antoine travelled the world for a few years before taking the management of Greenwood beach resort and the dive shop. 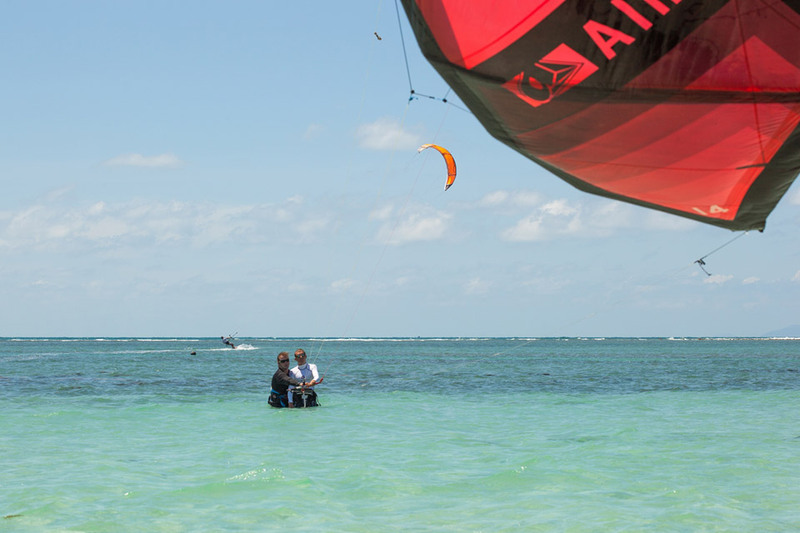 “When we saw the spot we realized the potential for a kite destination. We started the kite school last January, and certified around 100 new rider” Pauline is a scuba diving instructor, Antoine is dive master and kiteboarding instructor, they are running the resort and dealing with the activities (kiteboarding, scuba diving, free diving, snorkeling, slacklining. Been to Hua Hin? What did you think? Where are the Best Kitesurfing Beaches in Hua Hin? Koh Samui is the 3rd largest tropical island on the southeastern part of Thailand. The island has many waterfalls, coconut trees, beautiful white sandy beaches and a reef that protects the bay. Although the island is well known for it's famous full and half moon beach parties, it is also getting more popular for kitesurfing. Koh Phangan is surrounded by lagoons, has very low tides during April, May, June July and August. Kiteboarding at low tide is not possible because the water is too shallow. Phuket is windier than all the other spots in Thailand. It has a nice and warm climate, flat and shallow water and offers a lot of space for kitesurfers. From May to October, is the Southwest wind season (North West from the island). 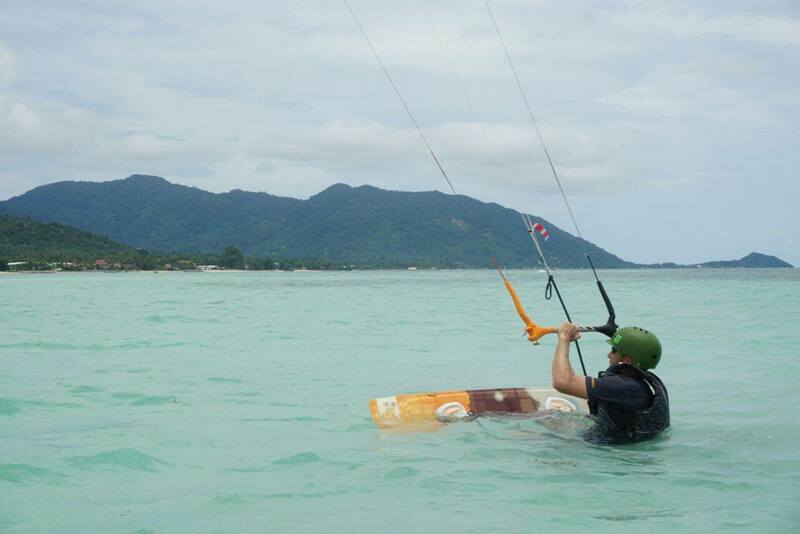 When is the Best Time to go Kitesurfing in Hua Hin?